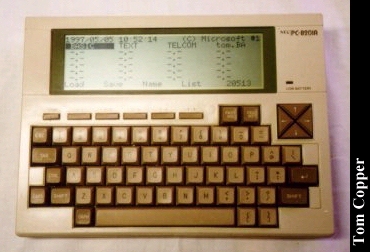 In 1983 Kyoto Ceramics, Kyocera, started manufacture of a series of light weight battery powered computers based on a CMOS microprocessor called the 8Oc85. There were eight variations produced under four brand names. Seven were built by Kyocera, including the Tandy 100, and one by NEC, the PC820la/PC8300. Powered by 4 AA batteries or an optional 6 volt AC adapter. Screen display 40 characters wide and 8 lines long on an LCD screen. Size of a 3 ring notebook. Text Editor (TEXT), BASIC programming language (BASIC), and telecommunications (TELCOM) software permanently in ROM. Ability to take programs on an optional ROM socket. Could save and load programs and data from a cassette recorder with a special cable. Simple text based point and shoot interface. Sort of a text Macintosh. Could take memory cartridges up to 128K in a special expansion slot. The Kyocera KC85, Tandy 100/ 102/200 and Olivetti were all produced by Kyocera as the NEC PC820la/8300 were produced by NEC. Tandy had the best distribution network and probably the most common, where the NEC is seldom encountered, probably due to its limited production and availability. Click here to view all comments for the NEC PC-8201a and to leave your own. Click here to view comments about other NEC computers.